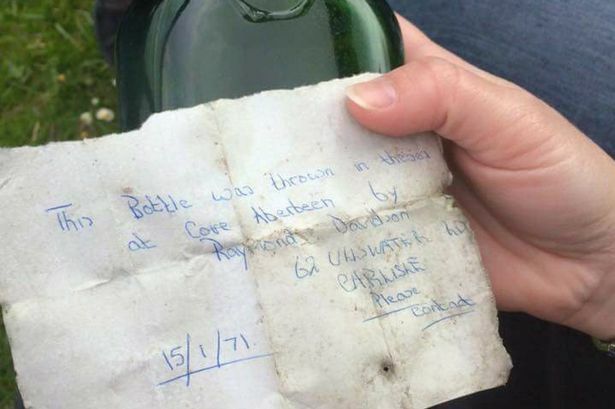 The author of a message in a bottle which was chucked into the ocean 44 years ago has been found. The mysterious bottle was found by Aussie travellers Sean and Shelley Thomas in a sand dune at Rattray Head on Scotland’s north-east coast. In under an hour the HeirHunter UK team supplied contact details to Sue. A woman is trying to trace a sister she did not know she had after finding a letter on her father’s grave. Sue Gallagher found a note signed only as Jodi from a woman who wanted to know more about her father Victor Edwards. “I didn’t know I had an extra sister,” said Mrs Gallagher who has left messages in reply to no avail.